My colleague got engaged a few weeks ago and will be getting married in early April 2013. She is the anti-bride. She would be happy to go to city hall and sign some papers, but her fiance is insisting on a proper wedding. He's a sweetheart, but he has absolutely no idea what goes into planning a "proper" wedding. Every aspect of this has been stressful for her, not the least of which: choosing a dress. I know, I know, everyone has trouble choosing a dress. She went to a number of places here in Boston, and they kept putting her in these super-bridey poofy numbers. The main problem is that she has fallen in love with this Carolina Herrera beaut... but it's not exactly screaming wedding, and it's not exactly the most cost-effective option out there (it's from the fall collection so the saleswoman gave her a "in the $9,000 range," but no promises of when it would be available.) Seeing as she's not pining for a wedding of any kind, dropping 10k on a dress seems...well... ridiculous. The wedding will be in Texas, and she's looking for something similar in concept to this, but also something that won't cause her granny to keel over from shock. This Reem Acra dress is another idea as well. She's got a stellar body and no scruples when it comes to non-traditional. Please ESB, do you have any ideas? Feel like shopping, you guys???????? Dunno about dresses but that hairstyle in the first photo calls for a Melrose Place-style black choker. This Temperley and London without the sash..if she is size two if $2500 is somehow a possibility. So what is the price range? A quick procrastination search unearthed these slinky and somewhat sparkly alternatives, but not exact replicas. Sequins don't come cheap. Hmm. Seems like the key search term here is "deco." Just saw this. Pretty much everything else on that site seems to be gross, but this one's not too bad (and it's significantly cheaper than the others). oh man! I would have totally LOVED that Badgley Mischka for my wedding dress. love. it. and. the. pricetag. to clarify, the one with beaded shoulders...I can't access Pinterest from this computer to see the first link, but I looked at all others thus far and this one is the winner. We need a poll, ESB! is she cool enough to wear a short dress? 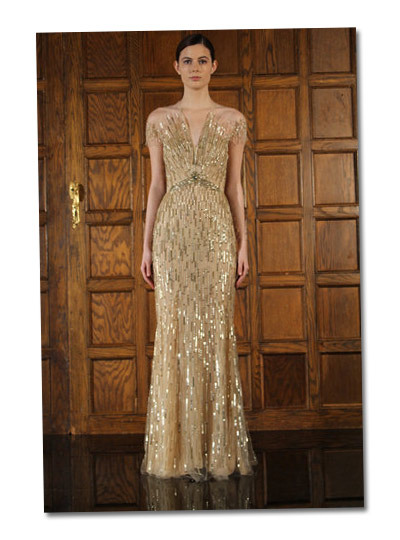 Jenny Packham. But the dresses start at 5K and you need 6 months minimum to order. There should be a ton in Boston. Beading is the Quintessential Bride not the Anti-Bride. Your friend will end up wearing Monique Lhuillier. Yeah, the anti-bride would wear a gorilla costume or something. This lady wants a long pretty sparkly gown. Jenny Packham dresses actually start at about £1200. FYI. Would it be weird to look at prom dresses? They might have more color/sparkle? And also be cheaper? A lot of bridal salons also stock prom/pageant gowns. I'm on Team Temperley London or Jenny Packham. If she's tiny, it's possible to buy a sample! I'm sure Boston or TX have sample boutiques (maybe?). I like the BHLDN dress and the Adrianna P. one at Nordstrom. I also like leenie's Jenny Packham. There's a ton at Bloomingdale's that I like (the only place I looked). If she's open to short, this might work! Go to Madeline's Daughter in NH, that's where I went to try on the Jenny Packhams. You certainly won't find them in Boston--I checked. I love the dress that Anon 6:39 posted. That's the first dress I thought of when I saw the Herrera. Budget options here and here. And then there's this Donna Karan gown embroidered with wood. BHLDN is the winner. For price and beauty and understated sparkle-factor. I really love it, if I had the body for it, it'd go in my big book of potential wedding dresses. The Monique Lhuillier Deco dress is breathtaking, but the price unfortunately isn't a kick in the arse off the original coveted-but-expensive dress. Ok, I don't have a link but I bought a similar looking dress for my wedding at the J. Crew collection store in NYC. Worth a look! It was $1500.